Home Automation is understood differently by different people. The word automation explains most of the meaning. Automation is to make something automatic. The easiest way to think of it is that home automation is the process of making your home capable of interacting with you and your needs as a smart home. How can your home interact with you? Is it by shaking when you are scared!! Actually you could (this is how much your home can be smart like you), but this is not what a home owner usually looks for. A home owner wants his or her home to turn on and off the lights automatically when he approaches or leaves a room, or a stairway for convenience. It is also desired to have a secured home with automatic recording cameras monitoring motions in different areas that are rarely attended. It is most wanted to gain the maximum comfort by automatically turn on and off air conditioners in a too hot or too cold day, especially when you are on the way home. It is maybe wanted (if you are romantic enough) to have different levels of lighting in your dining or living room to make your lights dim when you are ready for a romantic dinner or movie. The best feature of the home automation systems we provide is that you do not have to be home to have something done at home. These systems have the capability to communicate with you wherever you are, through your cell phone (because they could recognize your voice!! ), internet connection, and e-mail. The best of the best feature is that they cut your energy consumption or electricity bill amount by turning off appliances, lights, and different electronic devices automatically when you are not around or whenever they are not needed. 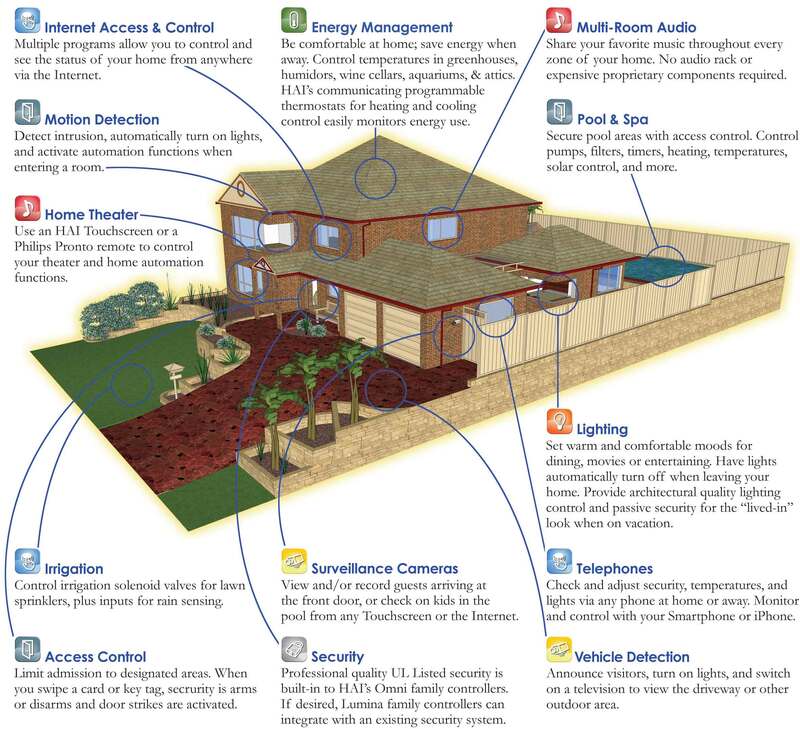 Our systems make your home smart enough to recognize when and when not these devices are needed. Weather you are already a home owner, an expectant home owner, or a home builder, you can make use of our products that can be customized specifically for you and your needs. Adding home automation to your existing home can be as cheap as $40. You will be surprised what these small systems can do. If you are expecting your home to be ready for you soon or planning to build a new home, give us a call, fax, or email and you will not regret it.